I’ve been writing this blog post in my head for nearly a month. Let me start by saying that I love milk… really love it. However, I’ve heard that it can cause mucous in the body. I’ve also heard that it’s not really that great for people to drink it. I own (and read) the book, Don’t Drink Your Milk, by Frank A. Oski, M.D. and have followed the theory that the Chinese (and other Asians) have less health problems than westerners because they avoid dairy. I’ve eliminated milk and milk products from my diet for months at a time and felt a noticeable improvement in my well-being. 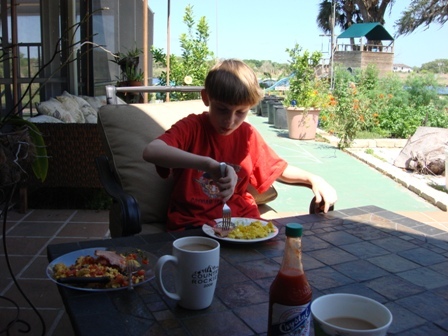 However, in my world, this dietary sacrifice never lasted and I welcomed the milk back… with a smile. I missed it too much, no matter how terrible the former Physician-in-Chief of John Hopkins Children’s Center says it is for me. A recent phone call from a friend rocked my world. She said that retail cow’s milk from the grocery store can give a baby goat Johnes disease (pronounced ‘yo-nees’). My reply was, “That’s ridiculous. Retail cow’s milk is ultra-pasteurized and ultra-dead, everybody knows that”. Oh… I was so wrong. I researched Johne’s disease which opened a can of worms. Pasteurization does not kill everything, nor does ultra-pasteurization. There is a common bacteria called mycobacterium paratuberculosis that can survive pasteurization. It is believed to cause Crohn’s disease in people, especially young people. The scientists and public health authorities know that the bacteria is associated with Crohn’s disease, but don’t have evidence that it directly causes Crohn’s. There are theories that genetic and/or environmental factors may also contribute to the development of Crohn’s, but it is unknown. There are millions of people suffering worldwide from this disease and the number is growing exponentially. I wonder why there is little effort to find out if the bacteria (mycobacterium paratuberculosis) that is present in our food supply is causing people to develop Crohn’s disease? It seems obvious that the bacteria is causing life-threatening illnesses in people and animals. If it isn’t… then it should be ruled out. In fact, more research is desperately needed. Fifty percent of Crohn’s disease patients are children and there is no cure. The bacteria (mycobacterium paratuberculosis) is also found in meat, cheese and water that is being sold to the general public for consumption in the U.S. and Europe. Are we at risk from the bacteria? That remains to be seen. 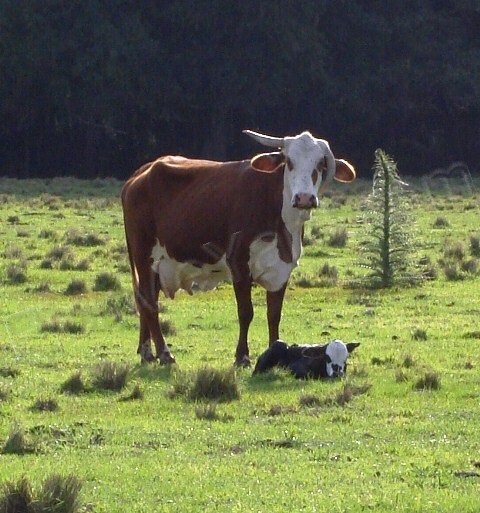 Most of my research implies that many dairies are unaware of Johne’s disease in their herds. It is almost impossible to detect in young livestock and probably too late when they show the deadly symptoms. There are ways to manage the disease, but none of them are easy. 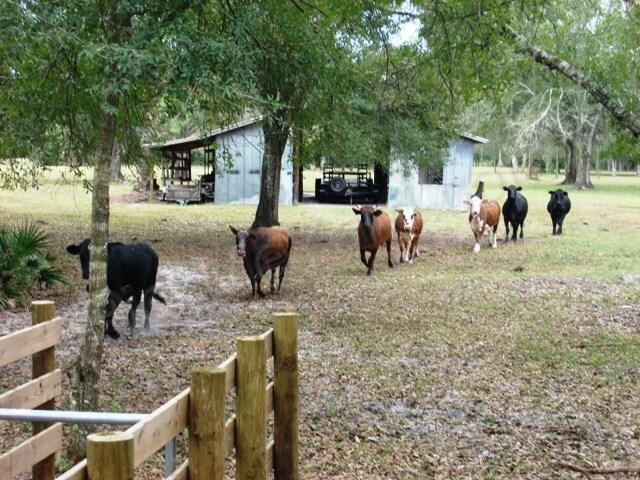 It is a 1.5 billion a year problem for the cattle industry. 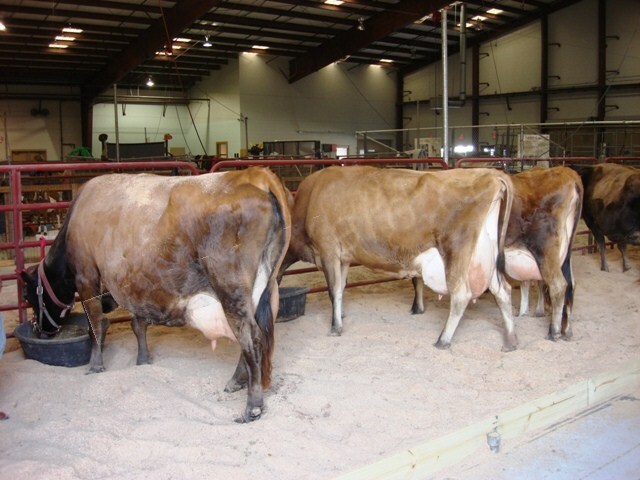 A survey conducted in 2007 showed that 68% of U.S. dairy herds were infected with mycobacterium paratuberculosis. I wonder what it has grown to now? Delicious milk. 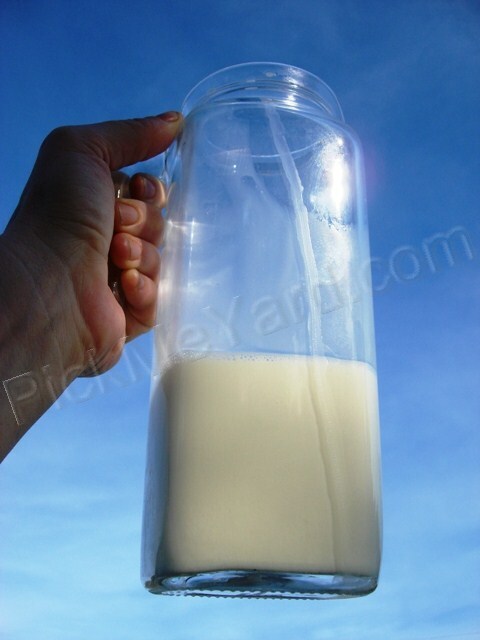 This is goat milk, which is white. Cow milk has a slight yellow tinge. 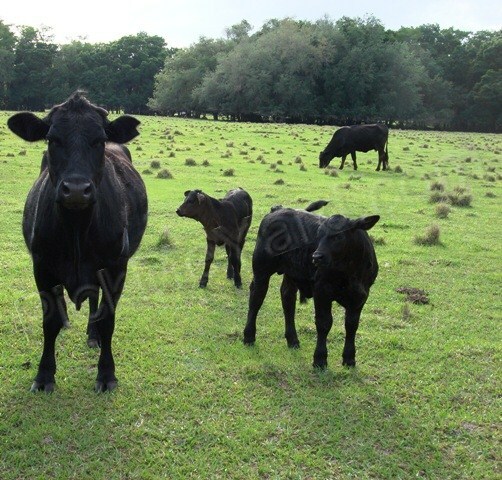 It seems that Johne’s disease is becoming more common in goats in Florida. I recently tested our milking doe and was relieved by the negative results, although I have babies that are still too young to test. ... till the cows come home. Are you concerned? Good. We need to know these things and we cannot ever stop asking questions. Do you think it’s a conspiracy theory? I’m okay with that. Check out this report from the American Academy of Microbiology. They believe that if MAP is associated with human disease and is in the U.S. food supply, this will be a public health concern to rival that of TB in the early part of the 20th Century. Are you wondering if I buy cow’s milk for my family? The answer is no, not anymore. Our children are in 4-H and goats are their project. We feel blessed and the goats are part of our family (must be why they call them “kids”). 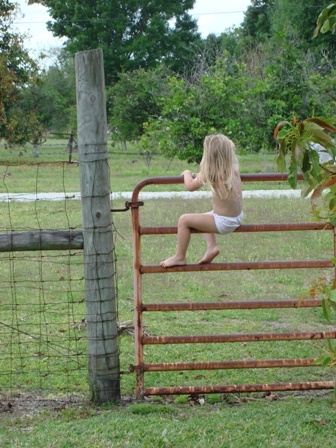 Hmmm… so you can’t keep a goat on your patio… what to do, what to do? You do have options: rice milk, almond milk, soy milk (choose non-GMO), oat milk or coconut milk. Grayson milking a Nigerian dwarf goat. The Crohn’s & Colitis Foundation of America is hosting a webcast called, “Pediatric Crohn’s: Finding the Right Path to Care” on May 19th at 8:00 p.m. I refuse to use glyphosate (Roundup) to kill my weeds for many reasons. (That’s a topic for another blog.) So, I do all my weed-pulling the old-fashioned way… by hand. 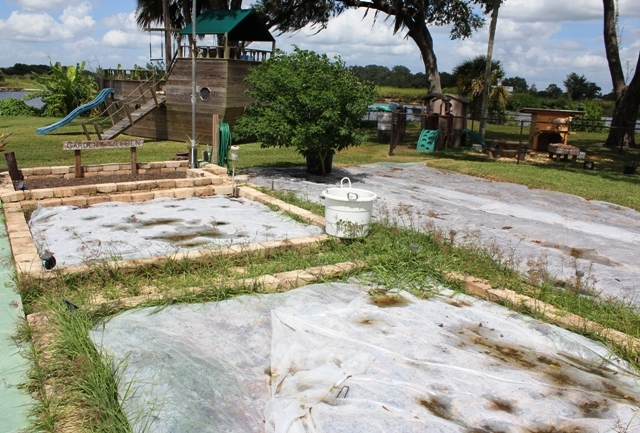 It’s an over-whelming task for a Florida gardener in the summertime. Ideally, I would go outside and pull weeds everyday to stay on top of the situation, but that just ain’t gonna happen. 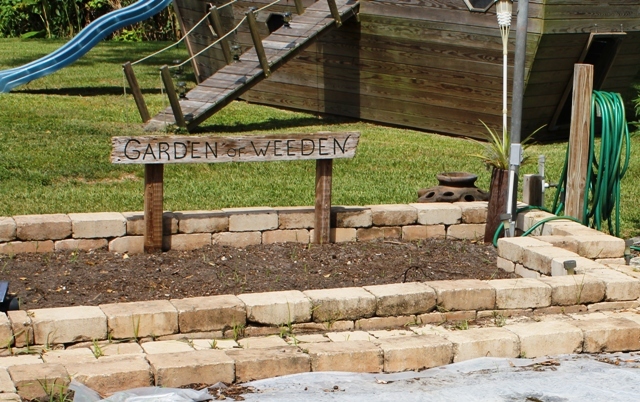 The weeds in the above picture took over my garden bed when I blinked. 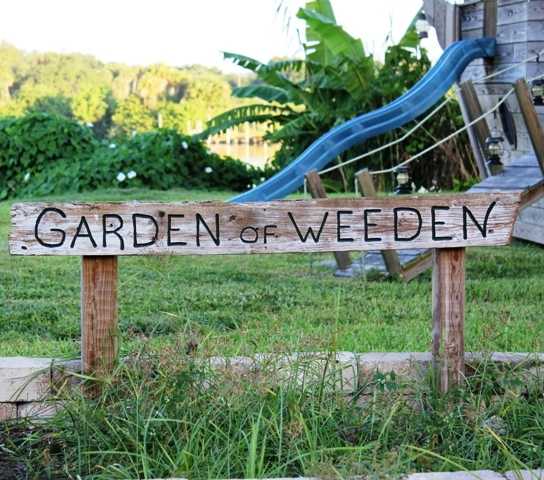 The seeds on the tops of those weeds will make the problem even worse because they will re-seed all over the place. It’s not the end of my gardening world though and it doesn’t take me long to pull the weeds out. They’re going to grow where I don’t want them no matter what I do. The bright side is that they won’t germinate as much in the winter, so I do get a much-needed break. Loring picks the weed "flowers" and makes a bouquet with them. I just recently put the clear plastic down to help suppress the weeds. As you can tell by the picture, the weeds laughed at me. They will grow through a pin prick in the plastic. The picture is embarrassing to me because it looks so untidy, but it is reality. I needed a break from the gardening beds during the hot, rainy months so I used the plastic. 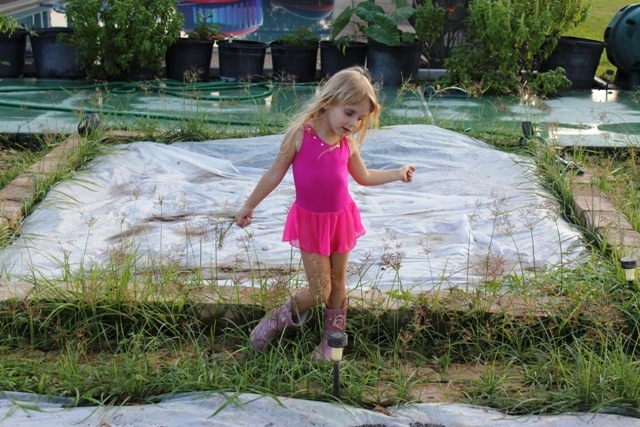 Many gardeners are against using plastic in the garden because it isn’t sustainable. I’ve learned that I have to do what works for us. I can clean up the garden bed in the above picture in a jiffy. It looks worse than it is. You should have seen my kitchen 30 minutes ago. 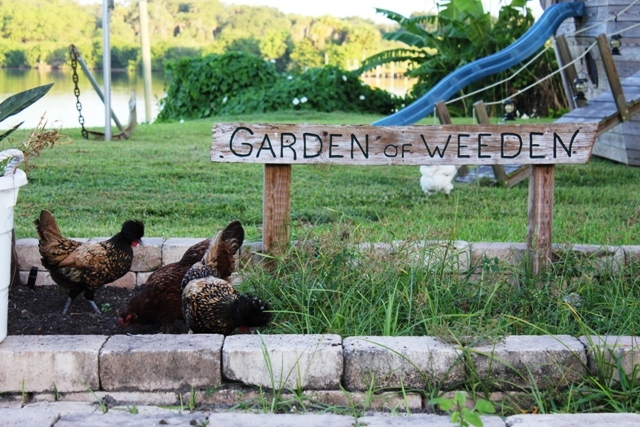 My chickens love the weeded garden. My chickens love to hover underneath me when I’m weeding the garden. It all looks so tidy for about 5 minutes when I finish, then the girls spread the fresh dirt everywhere. It’s okay with me… they’re getting the bugs. I don’t try to weed the entire garden in one day. It hurts my hands pretty bad to do that. Most people use machines to make their lives easier when it comes to these tasks, but I am stubbornly old-fashioned with my garden. It usually takes me about a week to get the weeds under control again. I don’t do too much at one time. 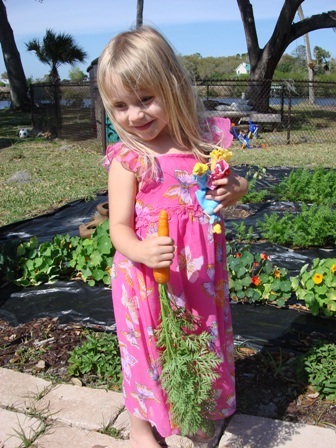 We’re getting our garden ready for our fall season vegetable garden. Grayson’s really excited to grow purple carrots and purple tomatoes. The purple tomatoes are from seeds that have been passed down from the Cherokee indians. We’re making a teepee out of pole beans as well. The teepee structure is up and we’re just waiting for some bean vines to grow on it. We’re growing our lettuce a little different this year. We always grew it in big pots and it was so wonderful. We would cut it for the table and it would grow again. It was not funny at all to find that the chickens had demolished every last scrap of lettuce one afternoon. They didn’t bother it for 2 months. Then, all of a sudden… gone. We’re growing our lettuce inside the pool cage this year. I think we may have outsmarted them. The tomato bed is getting a temporary fence around it this season. A friend asked me recently why I would go through so much trouble to grow our own fruits and vegetables when I could just buy them in the grocery store. My answer is that I don’t consider it “trouble” to garden in our yard and I have more control over the food my family is eating. My post today is only one reason we are backyard gardeners, but it is a big one. My biggest concern is genetically modified (GM) food. There is a lot of talk about it in the media lately that can be confusing. There is a huge amount of information to sort through, but it is absolutely crucial that we all understand what is happening. We are all part of a huge biological experiment. We are the guinea pigs. Food is being industrialized. Genetically modified foods have been engineered for many reasons, but the bottom line is that food is being genetically modified for bigger profits. Genetic engineering is done by splicing genes through molecular cloning and transformation to alter the organism’s genes. This is a new thing for scientists so they are making many mistakes while they try to figure it out. The problem is not that scientists are advancing technology, it’s that they have already let out their genetically modified seeds for economic reasons and the seeds are wreaking havoc on a global scale. The responsibility lies mostly with a company called Monsanto. Monsanto was founded in St. Louis, Missouri in 1901. They are credited with products such as saccharin, aspartame, DDT, Agent Orange, Round-Up, bovine growth hormone, PCB’s, and many, many others. Monsanto has genetically modified thousands of seeds. They own these seeds because they have them patented. They have over 11,000 patented GMO seeds. In 2003, the Washington Post did a front-page article on the environmental damage that Monsanto did to a small town in Alabama. They had a factory there that was knowingly dumping PCB and mercury waste into local creeks for 40 years. They paid out over $700 million in settlements for this case. There are others like this one. Monsanto has been sued and settled many times for poisoning its employees. In January of 2010, Monsanto was named company of the year in Forbes. So…do you feel comfortable with them making the food you feed your children? I don’t want them anywhere near our food. The research that has been done on the effects of consuming GM food is questionable. There is a serious conflict of interest between the lobbyists and the FDA. The facts that are coming out speak volumes. My opinion is that this experiment needs to come to an end and we need to let nature do what she does best…be nature. Do we need to improve nature? These huge food companies seem to rule the world. They are extremely powerful and have a dangerous amount of control over our food supply. Our only defense is knowledge. These powerful companies do not want us to be informed and they don’t want us to question what they are doing. To them it is about money and to us it is about safety. I want to have a choice about whether I choose to buy GM food. If the food isn’t labeled as GM, then there is no way to know. The only way to know if you are eating GM food is from a website called NonGMOShoppingGuide.com. I urge you to visit this website. It is very informative. They also have a free app for the iPhone called ShopNoGMO. High fructose corn syrup is on the GM list and so is sugar. Apparently, if the label doesn’t say cane sugar or dehydrated cane sugar then it is probably sugar from beets. There is a 90% chance that it is GM beet sugar. After you visit the website, you will realize that you are probably eating a lot more GM food than you thought. Genetically modified organisms (GMO’s) have been linked to thousands of allergic reactions, sick, sterile, and dead livestock and damage to virtually every organ and system studied in lab animals. Almost every safety study on animals that has been carried out independently has shown adverse or unexplained effects. Switzerland has put a moratorium on GM food until 2012. The European Union has GM foods, but they require that it be labeled as such. Europe is showing a lot of resistance toward GM food. The Consumers Union of Japan are very against GM foods. They say that independent research is being blocked by the GM corporations that own the GM seeds and reference material. A subsidiary of Monsanto in India is allegedly employing children for $.50 a day to handle poisonous pesticides. More than 4,500 farmers have committed suicide because of the debt the GM seeds have caused them. The suicide rate is increasing. The United States has no regulations on GM food. There is no labeling requirement. The concern over GM foods hasn’t been high in the U.S. and we haven’t shown much concern about it. A really good documentary was released in 2005 called The Future of Food. Click here to watch it for free. I highly recommend this film. You won’t be able to stop watching it. It is very easy to follow and you will be glad that you watched it. The movie answers a lot of questions. Another great documentary is The World According to Monsanto that was released in 2008. Click here to watch it for free. A good website to visit for more information is Jeffrey M. Smith’s Institute for Responsible Technology. He also has a blog that is linked to the website. The future of genetically modified food lies in anything out of the ocean, livestock, poultry, insects, trees and etc.. The possibilities are endless. The future is up to us. We need to be educated, stand together, grow together and demand that they leave our genes alone.